$500 note of the fourth Zimbabwean dollar. Use of the Zimbabwean dollar as an official currency was effectively abandoned on 12 April 2009. The Zimbabwean dollar was demonetised in 2015, with outstanding accounts able to be reimbursed until April 30, 2016. The Zimbabwean dollar's predecessor, the Rhodesian dollar was essentially equal to half of a pound sterling when it was adopted during the decimalisation of 1970, the same practice which was used in other Commonwealth countries such as South Africa, Australia, and New Zealand. The selection of the name was motivated by the fact that the reduced value of the new unit correlated more closely to the value of the US dollar than it did to the pound sterling. The main illustration on the obverse of all of the banknotes issued from 1980 to 2009 was the Chiremba Balancing Rocks in Epworth, Harare. The rocks were used as a metaphorical theme to explain the importance of development coupled with preserving the fragile environment. The rocks were also part of the Reserve Bank's emblem, which was used for all Bearer and Agro cheques, which circulated between 15 September 2003 and 31 December 2008. The reverse of dollar notes often illustrated the culture or landmarks of Zimbabwe. The first Zimbabwean dollar was introduced in 1980 and replaced the Rhodesian dollar at par. The initial ISO 4217 code was ZWD. At the time of its introduction, the Zimbabwean dollar was worth more than the U.S. dollar in the official exchange market, with 1 ZWD = 1.47 USD. However, this value did not reflect reality. As a result, the currency's value, both in the official and parallel markets eroded rapidly over the years. On 26 July 2006, the parallel market value of the Zimbabwean dollar fell to Z$100=GB£1. In October 2005, the head of the Reserve Bank of Zimbabwe, Dr. Gideon Gono, announced: "Zimbabwe will have a new currency next year." New banknotes and coins were to replace the then current Zimbabwean dollar. Gono did not provide a name for this new currency. In June 2006, Deputy Finance Minister David Chapfika stated that Zimbabwe had to achieve macroeconomic stability (i.e., double digit inflation) before any new currency was introduced. On 1 August 2006, the first dollar was redenominated to the second dollar at the rate of 1 revalued second dollar = 1000 old first dollars. The new dollar was subdivided into 100 cents, although cents were not used in practice. Together with the redenomination, the government devalued the dollar by 60% against the US dollar (see exchange rate history table below), from 101,000 old dollars (101 revalued) to 250 revalued dollars. ISO originally assigned a new currency code of ZWN to this redenominated currency, but the Reserve Bank of Zimbabwe could not deal with a currency change, so the currency code remained 'ZWD'. The revaluation campaign, which Gideon Gono named "Operation Sunrise", was completed on 21 August 2006. It was estimated that some ten trillion old Zimbabwe dollars (22% of the money supply) were not redeemed during this period. On 12 December 2006, Gono hinted in a memorandum to banks and other financial institutions that he would lay out the next phase of his monetary reforms, dubbed "Project Sunrise Two", when he announced the monetary policy review statement in January 2007. It was not possible to get immediate confirmation from Gono's office whether the memorandum was advice to banks that he would be launching the new currency in January. Even so, the chief executive officer of one of the country's largest banks said industry players had understood the governor's memo to mean new money would be introduced the next month. A possible name appeared to be "ivhu", which means "soil" in Shona. The following year, on 2 February 2007, the RBZ revealed that a new (third) dollar would be released soon and gave some details of the new banknotes (see below). However, with inflation at the time still in the four digits, the banknotes remained in storage. During the same month, the Reserve Bank of Zimbabwe declared inflation illegal, outlawing any raise in prices on certain commodities between 1 March and 30 June 2007. Officials arrested executives of some Zimbabwean companies for increasing prices on their products. Economists consider such measures ineffective at eliminating the problem of high inflation, since high sustained inflation is a symptom of high, sustained growth in the money supply. On 15 June 2007, economist Eddie Cross reported: "There is talk that the Reserve Bank will cut another three zeros off our currency next week and this would mean that one Zimbabwe dollar would now equal one million of the old dollars. Chaos reigns in commerce and industry and those in the public sector are frantic." On 6 September 2007, the Zimbabwe dollar was devalued again, this time by 92%, to give an official exchange rate of ZW$30,000 to US$1, although the black market exchange rate was estimated to be ZW$600,000 to US$1. Meanwhile, the WM/Reuters company introduced a notional exchange rate (ISO ZWN) which more accurately reflected black market exchange rates. Due to a shortage of foreign exchange in the country, the official rate was nearly impossible to obtain. The method of calculation was based on Purchasing Power Parity utilising the dual listing of companies on the Harare (ZH) and London Stock exchanges (LN). In particular, the Old Mutual Implied Rate (OMIR) was calculated by dividing the Zimbabwe Stock Exchange price of shares of the insurance company named "Old Mutual" by the London Stock Exchange Price for the same share. Reserve bank governor Gideon Gono announced on 30 July 2008 that the Zimbabwean dollar would be redenominated. Effective 1 August 2008, ZW$10 billion would be worth ZW$1; the new currency code was ZWR. The planned denominations to be issued are coins valued Z$5, Z$10 and Z$25 and banknotes worth Z$5, Z$10, Z$20, Z$100 and Z$500. While the German firm of Giesecke & Devrient was no longer printing Zimbabwean currency, The Daily Telegraph reported that the new currency was printed before the relationship was severed and had been kept in storage since then. Due to frequent cash shortages and the worthless Zimbabwean dollar, foreign currency was effectively legalised as a de facto currency on 13 September 2008 via a special program to officially license a number of retailers to accept foreign money. This reflected the reality of the dollarisation of the economy, with many shop keepers refusing to accept Zimbabwe dollars and requesting U.S. dollars or South African rand instead. Despite redenomination, the RBZ was forced to print banknotes of ever higher values to keep up with surging inflation, with ten zeros reappearing by the end of 2008 (see below). On 2 February 2009, the RBZ announced that a further 12 zeros were to be taken off the currency, with 1,000,000,000,000 (third) Zimbabwe dollars being exchanged for 1 new (fourth) dollar. New banknotes were introduced with a face value of Z$1, Z$5, Z$10, Z$20, Z$50, Z$100 and Z$500. The banknotes of the fourth dollar circulated alongside the third dollar, which had to remain legal tender until 30 June 2009. The new currency code was ZWL. By the end of 2009, the Zimbabwean dollar was reported to have become largely irrelevant, with the economy by then being almost completely dollarized. Even the national postal service, Zimpost, was said to be charging customers postage in US Dollars, even though some of the stamps were in Zimbabwean Dollar denomination. Zimbabwe finance minister, Tendai Biti, said in his first budget report, "The death of the Zimbabwe dollar is a reality we have to live with. Since October 2008 our national currency has become moribund." In late January 2009, acting Finance Minister Patrick Chinamasa announced that all Zimbabweans would be allowed to conduct business in any currency as a response to the hyperinflation crisis. On 12 April 2009, media outlets reported that economic planning minister Elton Mangoma had announced the suspension of the local currency "for at least a year", effectively terminating the fourth dollar. Rampant inflation and the collapse of the economy severely devalued the currency, with many organisations using the United States dollar, the euro, the pound sterling, the South African rand, or the Botswana pula instead. In the early 2000s, Zimbabwe started to experience hyperinflation. Inflation reached 623% in January 2004, then fell back to low triple digits in 2004 before surging to 1,281.1% in 2006. Inflation reached another record high of 3714% (year-on-year) in April 2007. The monthly rate for April 2007 exceeded 100%, implying that inflation may soon exceed all forecasts, as 100% monthly inflation over sustained 12 months would produce annual inflation of over 400,000%. Mid-year inflation for 2007 has been breaching records as inflation for May 2007 was estimated at 4,530% (year-on-year). Within two months, unofficial inflation had reached 11,000%, and the black-market exchange rate with the British pound was Z$400,000 per £1. On 13 July 2007, the Zimbabwean government said it had temporarily stopped publishing (official) inflation figures, a move that observers said was meant to draw attention away from "runaway inflation which has come to symbolise the country's unprecedented economic meltdown." On 27 July 2007, the Consumer Council of Zimbabwe (CCZ) said its recent calculations for the monthly expenditure for an urban family of six showed that inflation for the month of June was more than 13,000%. The Central Statistical Office (CSO), the official source of Consumer Price Index numbers, had not released its figures since February (2007) when it reported annual inflation at 1,729%. In September 2007, the Central Statistical Office announced an official inflation rate of 6,592.8% for August 2007. Private estimates were as high as 20,000%. In October 2007, they announced an official inflation rate of 7,892.1% for September 2007. In November 2007, they announced an official inflation rate of 14,840.5% for October 2007. Official, black market, and OMIR exchange rates 1 January 2001 to 2 February 2009. Note the logarithmic scale. Moffat Nyoni, the chief statistician of the Central Statistical Office, announced that the inflation rate would no longer be calculated after November 2007, due to the lack of availability of basic goods and the consequent lack of information from which to calculate the inflation rate. The International Monetary Fund stated that inflation was predicted to rise to 100,000% per annum. His office continued calculating past inflation rates, announcing in February 2008 that December had seen 66,212.3% inflation and an exchange rate of Z$7.1 million per US$1, while the January inflation rate had risen to 100,580.2%. Official rates rose to 164,900.3% in February, and 355,000% in March, and unofficial rates surpassed one million percent in May (the Central Statistical Office again having given up because of the lack of goods). The office resumed estimates in early winter, announcing June rates of nine million percent, and nearly a quarter billion percent in July. As predicted by the quantity theory of money, this hyperinflation has been caused primarily by the Reserve Bank of Zimbabwe's choice to mushroom the money supply. Since February 2009, following a period of hyperinflation and widespread rejection of the devalued currency, companies and individuals are permitted to transact domestic business in other currencies, such as the US$ or the South African rand. In consequence, the Zimbabwean economy has undergone dollarisation and the Zimbabwean dollar has fallen out of everyday use. In late August 2006, it was reported that about ZW$10 trillion old dollars (22% of the money supply) had not been exchanged for revalued dollars. These bearer cheques were demonetised. On 27 June 2007, it was announced that central bank governor Gideon Gono had been ordered by President Robert Mugabe to print an additional Z$1 trillion to cater for civil servants' and soldiers' salaries that were hiked by 600% and 900% respectively. On 28 July 2007, it was reported that Mugabe said that Zimbabwe would go on printing money if there was not enough for underfunded municipal projects. On 30 August 2007, it was reported that an additional ZW$3 trillion had been printed to pay for 500,000 scotch carts and 800,000 ox-drawn ploughs plus an unspecified number of cattle. On 3 September 2007, it was reported that the black market in Zimbabwe is once again booming despite price controls. People who previously were employed for US$11 (Z$2 Million) a month are now able to turn as much as US$166 (ZW$30 Million) just through black market trading. On 24 November 2007, it was reported that money supply was now $58 trillion revalued Zimbabwean dollars (ZWD) ($41 million US at parallel rates). However, Zimbabwe banks could only account for Z$1–2 trillion of those dollars, meaning that members of the public were holding Z$56–57 trillion in cash. On 4 January 2008, it was reported that money supply had been increased by Z$33 trillion to Z$100 trillion revalued Zimbabwean dollars (ZWD). Further, the demonetisation of the Z$200,000 bearer cheques was put on hold, thus increasing the money supply. The planned issue of additional banknotes (denominations of Z$1, Z$5, and Z$10 Million) on 18 January 2008 will increase the money supply by an unknown amount. On 21 January 2008, it was reported, by Gideon Gono, that the money supply had been increased to Z$170 trillion since the middle of December. Further, Gono expected it to reach $800 trillion by 28 January 2008. On 1 March 2008, it was reported that documents obtained by The Sunday Times show the Munich company Giesecke & Devrient (G&D) was receiving more than €500,000 (£382,000) a week for delivering bank notes equivalent to Z$170 trillion a week. The regime is surviving by printing money: at this stage there is no other way. Martin Rupiya, professor (war and security studies), University of Zimbabwe. According to a source at the Reserve Bank of Zimbabwe, G&D was delivering 432,000 sheets of banknotes every week to Fidelity printers in Harare, where they were stamped with the denomination. Each sheet contains 40 notes and the current production is entirely in Z$10 million notes. On 1 July 2008, Giesecke & Devrient responded to pressure from the German government by suspending production of bank notes for Zimbabwe. In the Guardian, on 18 July 2008, a report on Zimbabwe's inflation, said that an egg costs Z$50 billion (GBP 0.17, USD 0.32), and it showed adverts for prizes of Z$100 trillion in a Zimbabwean derby and Z$1.2 quadrillion ($1,200,000,000,000,000.00: approx. £2,100; $4,200) in a lottery. It also showed a monthly war pension currently is Z$109 billion (37 pence, 74¢), shops can only cash cheques if the customer writes double the amount, because the cost will go up by the time the cheque has cleared, and people can only withdraw a maximum of Z$100 billion from cashpoints. On 23 July 2008, an Austro-Hungarian company based in Vienna confirmed that it is providing the Reserve Bank of Zimbabwe with the licences and software required to design and print Zimbabwe currency. The company, named Jura JSP, said it would consider ending its supply of licences and software if the European Union required it to do so. Without the licences and software, the Reserve Bank of Zimbabwe may be unable to print notes in larger denominations than are already in circulation. On 24 July 2008, the Reserve Bank of Zimbabwe announced that "appropriate measures are being put in place to address the current setbacks being faced on the currency front, as well as on financial and accounting systems." It promised that in "the next few days" it would institute changes to the minimum cash withdrawal limits and IT systems' constraints, and limited cash withdrawals to ZW$100 billion per day, which is less than the cost of a loaf of bread. IT systems cannot handle such large numbers; the automated teller machines for one major bank give a "data overflow error" and freeze customers' attempt to withdraw money with so many zeros. That same day, the Institute of Commercial Management reported that ZW$1.2 trillion is worth the same as one British pound. From January to December 2008, the money supply growth rose from 81,143% to 658 billion percent. The use of foreign currencies was legalised in January 2009, causing general consumer prices to stabilise again after years of hyperinflation and price speculation. The move led to a sharp drop in the usage of the Zimbabwean dollar, as hyperinflation rendered even the highest denominations worthless. On 2 February 2009 the Zimbabwean dollar was redenominated once more, at the ratio of 1 000 000 000 000 (1012) ZWR to 1 ZWL. The third dollar was expected to be demonetised on 1 July 2009, but the complete abandonment of local currency was hastened by the decline in overall consumer usage of local currency in favour of other currencies, helped by the legalisation of the use of hard currencies in January 2009. The Zimbabwean dollar was effectively abandoned as an official currency on 12 April 2009 when the Economic Planning Minister Elton Mangoma confirmed the suspension of the national currency for at least a year, but exchange rates with the Zimbabwean dollar were maintained for up to a year afterwards. The current government of Zimbabwe said that the Zimbabwean currency should only be reintroduced if the industrial output was 60% or more of its capacity, compared to the April 2009 average of 20%. On 29 January 2014 the Zimbabwe central bank announced that the US dollar, South African rand, Botswana pula, Pound sterling, Euro, Australian dollar, Chinese yuan (renminbi), Indian rupee and Japanese yen would all be accepted as legal currency within the country. On 12 June 2015, the Reserve Bank of Zimbabwe said it will begin a process to demonetise the Zimbabwean dollar, to officially value the fiat currency at zero. The plan is to have completed the switch to the US dollar by the end of September 2015. The Zimbabwean government stated that it would credit 5 US dollars to domestic bank accounts with balances of up to 175 quadrillion Zimbabwean dollars and exchange Zimbabwean dollars for US dollars at a rate of 1 USD to 35 quadrillion Zimbabwean dollars to accounts with balances above 175 quadrillion Zimbabwean dollars. On 11 December 2015, The Herald reported that the Reserve Bank of Zimbabwe had paid out about $7.2 million U.S. dollars in compensation for redemption of demonetized Zimbabwe dollars. Banks paid out about $7.2 million in compensation for the demonetized Zimbabwean dollar, figures from the Ministry of Finance and Economic Development show. The demonetization process of the local currency began in June 2015 after the country adopted the use of multi currencies anchored by the US dollar in February 2009. It was meant to stabilize the economy and establish a credible nominal anchor under low inflation conditions. By the end of November 2015, total verified balances were $15.8 million; about $10 million was disbursed to the banks while 483 140 accounts were paid out. The number of paid out accounts represent 47 percent of verified balances. Clients of closed banks were paid about $826 000 while walk-in clients received $740 000. The exercise brought closure to the outstanding issue on the Zimbabwe dollar, further confirming the Government’s position that the local unit will not return anytime soon. The Government has maintained that the return of the Zimbabwe dollar would only be considered when key economic fundamentals such productivity in key sectors have been achieved. In 1980, coins were introduced in denominations of 1, 5, 10, 20, 50 cents and 1 dollar. The 1 cent coin was struck in bronze, with the others struck in cupro-nickel. In 1989, bronze-plated steel replaced bronze. A 2 dollar coin was introduced in 1997. In 2001, nickel-plated steel replaced cupro-nickel in the 10, 20 and 50 cents and 1 dollar, and a bimetallic 5 dollar coin was introduced. Plans by the Reserve Bank of Zimbabwe, for new Z$5,000 and Z$10,000 coins were announced in June 2005. However, the coins never appeared. All old coins dating from the first dollar were reintroduced at face value to the third dollar in Aug 2008, effectively increasing their value 10 trillion-fold, and new $10 and $25 coins were introduced. These coins were minted in 2003 but only issued with the redenomination. In its 2014 mid-term monetary policy statement, the Reserve Bank of Zimbabwe (RBZ) said would import special coins with similar value to those currently circulating in the economy to ease a shortage of change in the economy. The special coins are to be denominated in 1c, 5c, 10c, 20c, and 50c whose values would be at par with the U.S. cents, while South African rand coins of 10c, 20c, 50c, R1, R2 and R5 will also be imported. It, however, did not state when and where the coins would be imported. On Nov.26, 2014 it was reported that over $40 million worth of these coins were expected to be delivered, within the next week. to ease the shortage of change in the country. The special coins are called Zimbabwean Bond Coins. The 1c., 5c. ,10c. ,and 25c. denominations were released into circulation on 18 December 2014, with the 50c. denomination which was also released in March 2015. The banknotes of the Zimbabwean dollar were issued by the Reserve Bank of Zimbabwe from 1980 to 2009. Up to 2003, regular banknotes were issued but as hyperinflation developed from 2003, the Reserve Bank issued short-lived emergency travelers cheques, which were then quickly superseded by time-limited Bearer Cheques, in denominations ranging from $5,000 to $20,000 in 2003, then up to $100,000 dollars by early-2006. On 1 August 2006, new Bearer cheques with thirteen denominations ranging from 1¢ to $100,000 were issued following the first redenomination of the dollar, superseding the regular banknotes by 21 August 2006 and until August 2008. Bearer cheques of 5,000 dollars (dated 1 February 2007) and 50,000 (dated 1 March 2007) were issued in March 2007, followed by cheques of 200,000 (dated 1 August 2007) in August 2007. Subsequently, Gideon Gono of the RBZ announced on 19 December 2007 that new bearer cheques (Z$250,000; Z$500,000; and Z$750,000) had been produced and would be released on 20 December. Additionally, the current high value bearer cheques (Z$200,000) would be demonetised as of 1 January 2008. However, due to ongoing problems, plans to demonetise this note were put on hold at the end of December. Since the Zimbabwean dollar was revalued in August 2006, there were repeated discussions and proposals regarding a further revaluation. As early as the beginning of 2007 it appeared that a revaluation was planned with new banknote designs being commissioned. New plans were announced in October 2007 They were initially postponed until 2008 before, in November 2007, the revaluation was described as "imminent" and would remove as many as four zeros from the currency and would be called Sunrise 2. However, on 18 December 2007, it was reported that a further printing of the current Z$200,000 bearer cheques had been produced, seemingly instead of revaluing. Further new issues of bearer cheques have since taken place. At a press conference on 16 January 2008, reserve bank Governor Gono stated that "With effect from Friday (January 18), the Reserve Bank of Zimbabwe is releasing the following bearer cheques into circulation: one million dollars (officially worth about US$33/22 euros but worth about 50c at the parallel rate), five million dollars and 10 million dollars." He continued, "...daily cash withdrawals have been increased from the current Z$50 million to Z$500 million per individual." Less than a month after announcing a similar move, Gono said the new notes would provide much needed relief to consumers who often have to go shopping with sacks of cash. The Zim Independent and Zim Online reported on 4 April 2008 that 25 and 50 million dollar bearer cheques were issued on 4 April. The RBZ also increased the maximum withdrawal limit for individuals to $5 billion a day. On 6 May 100 million dollar and 250 million dollar bearer cheques were issued and the official exchange rate was floated to counter black market speculation. 10 days later, the RBZ announced that 500 million dollar bearer cheques and special agro cheques in the amounts of 5, 25, and 50 billion dollars would be issued were to be issued on 20 May. On 14 July 2008 Giesecke & Devrient ceased supplying bank note paper to Fidelity Printers & Refiners, the Zimbabwean government-owned company that printed Zimbabwean currency. Virtually incessant use of the currency-printing presses had caused many of the machines to break down, and repair parts were no longer being shipped to Zimbabwe to repair the machines. The Reserve Bank issued the $100 billion Agro Cheque on 21 July, which were printed prior to the suspension. On 30 July 2008 the RBZ announced a new currency, effective 1 August 2008, removing 10 zeros from the monetary value, by "a factor of 1 to 10". Banknotes in the denominations of $1, $5, $10, $20, $100 and $500 were introduced and replaced bearer cheques and agro cheques by 31 December 2008. However, the familiar cycle of printing ever higher denomination notes to keep up with inflation continued despite redenomination. A $1,000 banknote was introduced by the RBZ on 19 September 2008, and ten days later, as the unofficial exchange rate surpassed 270,000 ZWD to the US dollar, it issued new notes in the denominations of $10,000 and $20,000. A $50,000 banknote was released on 13 October 2008, followed by $100,000, $500,000, and $1,000,000 denominations announced on 3 November. The daily cash withdrawal limit was raised for individuals to Z$500,000 from Z$50,000 and for select companies it went up to $1 million. Banknotes valued at $10 million, $50 million and $100 million were issued as the withdrawal limit was increased to $100 million per week on 4 December 2008. Scarcely four days later, on 8 December, the RBZ issued a $200 million banknote, and introduced a $500 million note on 12 December, worth approximately US$8 at the time. In little over half a year, the billion denomination returned, with the RBZ issuing banknotes of $1 billion, $5 billion, and $10 billion on 19 December. Amid the continuing hyperinflation that rendered the currency virtually worthless, spurring the increasing dollarisation of the economy, the RBZ issued another set of new notes in denominations of $20 billion and $50 billion to be released 12 January. Stepping up another order of magnitude, the Reserve Bank introduced trillion-denominated notes for the first time, unveiling banknotes valued at $10 trillion, $20 trillion, $50 trillion, and $100 trillion on 16 January, which were supposed to help citizens still in formal employment to withdraw a full month's worth of salary by showing a corresponding payslip. As even these notes became increasingly worthless, a media campaign was launched in South Africa using the notes as printing paper. On 2 February 2009 the dollar was revalued once more, this time in the ratio of 1:1012, and new banknotes of the fourth dollar, with seven denominations from $1 to $500, were issued. These banknotes circulated alongside the third dollar until the abandonment of the dollar on 12 April 2009. † Due to the December 2007 banknote shortage, funds transferred via Electronic Funds Transfer Systems (EFTS) bore a premium rate of about $4 million, while the cash transaction rate varied around $2 million. ‡ Exchange rate was 20,000,000 for large amounts. The first dollar devalued from 0.6788 R$ to 1 US$ in 1978 to roughly half a million per US$ in 2006, when the currency was revalued. 1999 36.23 (Jan) 38.30 (Sep) On 31 March 1999, the Official Exchange Rate was pegged at ZWD 38 per USD; the parallel market had re-emerged by December 1999. 2000 38 to 55 56 to 62 (Jul); 65 to 70 (Aug.) In August 2000, the Official Exchange Rate was pegged at ZWD 50, then ZWD 51 and finally at ZWD 55 per USD; parallel black market rates were at a large premium; in November, foreign exchange bureaus were closed. 2001 55 70 (Jan); 80 (Feb); 100 (Mar); 120 (Apr); 140 (May); 160 (Jun); 250 (Jul); 300 (Aug); 400 (Sep); 300 (Oct); 320 (Nov); 340 (Dec) In June, the official rate became a crawling peg rate. 2002 55 380 (Jan) to 710 (Jun), 1400 (Jul) to 1740 (Oct) to 1400 (Dec) In 2002 the parallel black market for foreign exchange mushroomed. 2004 824 (1 January); 4196 (12 January) to 5730 (Dec) 5500 (1 January) to 6000 (Dec) In January 2004, semiweekly (RBZ-controlled) currency auctions were set up to determine the official rate. In November 2005, the regular currency auctions were discontinued and the RBZ announced that "market factors" would control the exchange rate. 2006 (to 31 July) 85,158 (3 January); 99,201.58 (24 January); 101,195.54 (28 April) 100,000 (6 January); 106,050 (19 January); 115,000 (20 January); 125,000 to 150,000 (25 January); 175,000 to 190,000 (24 February); 205,000 to 220,000 (3 March); 220,000 to 230,000 (13 April); 300,000 to 310,000 (25 May); 315,000 (9 June); 340,000 to 350,000 (16 June); 400,000 (21 June); 450,000 (1 July); 520,000 (9 July); 550,000 (27 July) Economists predict an unofficial rate of nearly ZWD 250,000 to the US dollar by mid-2006. 24 January – RBZ caps daily variance of official exchange rate based on volume traded. The ZWD is able to fluctuate (from its average rate) in a daily band of: 0% (under USD 5 million); 1% (USD 5 to 10 million); 1.5% (USD 10 to 15 million); or 2% (exceeds USD 15 million). This effectively froze the official exchange rate. The second dollar started off on 1 August 2006 with an official rate of 250 and a parallel rate of 550 to the US$. In July 2008 the dollar was revalued again, this time 10,000,000,000 2nd dollars became 1 3rd dollar, after the parallel rate reached 500 billion to 1 US$. Zimbabwean dollar becomes least valued currency unit around 21 March; In March, the parallel rate becomes extremely erratic, with reported rates varying significantly. A "special rate" of 15,000 ZWD per USD was brought in on 26 April 2007. The improved exchange rate will be applied to miners, farmers, tour operators, non-governmental organisations, embassies, Zimbabweans living abroad that repatriate earnings, and others who generate foreign exchange. Exporters will be required to exchange money at the central bank to receive the better rate. Due to the Dec 2007, banknote shortage, funds transferred via Electronic Funds Transfer Systems (EFTS) bore a premium rate of about $4 million, while the cash transaction rate varied around $2 million. The Old Mutual Implied Rate (OMIR) is calculated by dividing the Zimbabwe Stock Exchange price of the Old Mutual share by the London Stock Exchange Price for the same share. The answer is the Old Mutual Implied Rate for the Pound. Then a cross rate calculation is done for the USD rate. In the final months before Zimbabwe's central bank reforms of 30 April 2008, virtually all popular currency conversion resources relied upon the official rate of 30,000 ZWD to 1 USD for published figures, in spite of the vast differences between that and free market rates. By 23 May 2008, Bloomberg and Oanda began publishing floating rates based on Zimbabwe's formally regulated domestic bank market, while Yahoo Finance started using the updated official rate in July, albeit with a decimal point shift of 6 places. Those reported rates generally reflected the Official Rate as shown in the above table. They soon began to differ, in overvaluation of the Zimbabwean dollar, increasingly substantially in comparison to less regulated markets such as offshore markets or paper cash freely traded on the streets of Harare, reflected above as Parallel Rates. On 1 August 2008, ten zeroes were removed from the currency, reducing 10 billion Zimbabwean dollars to one dollar. On 3 October 2008, the Reserve Bank of Zimbabwe suspended temporarily the Real Time Gross Settlement (RTGS) system, halting electronic parallel market transfers, but it was reinstated on 13 November 2008. After being introduced on 1 August 2008, the third dollar continued to devalue. 1 August: The Reserve Bank revalued the dollar again: 10 billion ZWN (or 10 trillion ZWD) becomes 1 ZWR. "Zimbabwe’s re-valued currency after one month" includes a daily list of the ZWD parallel exchange rates in August 2008. Electronic bank transfers (RTGS) were suspended by the Reserve Bank on the 3rd. No funds can be transferred between banks, effectively aborting the parallel rates. As of 26 November newspaper reports stated the RTGS was still not operational, and part of the reason was that the Zimbabwean Government had not paid the company responsible for fitting the system. The Zimbabwe Stock Market, and consequently the OMIR, crashed on 20 November when allegations of market manipulation became public. ZSE chief executive Emmanuel Munyukwi revealed that a large number of multi-quad-, quin-, and sextillion cheques had bounced. Old Mutual has not traded since 20 November, so no meaningful OMIR figures are available. It is estimated that the OMIR on 25 November would have been 649,374,262,960,211. On 2 February 2009 the RBZ removed 12 zeros from the currency, with 1,000,000,000,000 (third) Zimbabwe dollars being exchanged for 1 new (fourth) dollar. Although the dollar was abandoned on 12 April 2009, exchange rates were maintained at intervals for some months. So, the fourth dollar would be worth 200,000,000,000,000,000,000,000,000,000,000,000, or 2 x 10^35 first dollars if never revalued. On 4 June 2015 it was announced that the Reserve Bank of Zimbabwe would exchange some of the old banknotes for US dollars. 12 April: Zimbabwe Dollar suspended. ↑ After the Zimbabwean dollar was suspended indefinitely from 12 April 2009, Euro, United States dollar, Pound sterling, South African rand, Botswana pula, Australian dollar, Chinese yuan, Indian rupee and Japanese yen are used as legal tender. The United States dollar has been adopted as the official currency for all government transactions. ↑ http://web.archive.org/web/20071022101722/http://www.telekurs-financial.com/dl_tkfich_customers_data_sources_exchanges_080906.pdf Currency reform Zimbabwe](pdf). Telekurs Financial. 9 August 2006. ↑ Ndlela, Dumisani. 78% old currency returned: RBZ. Zimbabwe Independent. The Zimbabwe Situation. 15 September 2006. ↑ Harare expected to unveil new currency next month. Zim Online. 14 December 2006. ↑ Rusere, Patience. Some Expect New Currency From Zimbabwe Central Bank In 2007. Voice of America. 14 December 2006. ↑ Wines, Michael. As Inflation Soars, Zimbabwe Economy Plunges. The New York Times. 7 February 2007. ↑ Zimbabwe jail over bread prices. BBC News. 1 December 2006. ↑ Eddie Cross. The Zimbabwe Situation. 15 June 2007. ↑ Raath, Jan. Devaluation is 'too little, too late' to save Zimbabwe. Times Online. 7 September 2007. ↑ 19.0 19.1 Shaw, Angus. Zimbabwe devalues currency; 10B becomes 1 dollar. Associated Press. 30 July 2008. ↑ Mafaro, Wayne. Mugabe says might declare state of emergency over prices. ZimOnline. 30 July 2008. Retrieved 30 July 2008. ↑ Berger, Sebastien; Thornycroft, Peta. Zimbabwe to cut ten zeros from banknotes in fight against inflation. The Daily Telegraph. 30 July 2008. Retrieved 30 July 2008. ↑ Zimbabwe shops stop accepting local currency. The Daily Telegraph. 27 October 2008. ↑ Zimbabwe Turns To the Greenback. The Washington Post. 4 December 2008. ↑ Shaw, Angus. Inflation in Zimbabwe surges to record 3,714%, the highest in the world. Associated Press. The Zimbabwe Situation. 17 May 2007. ↑ Zulu, Blessing. Zimbabwe Inflation Data Delayed Again; Estimate Points To 4,530%. Voice of America. The Zimbabwe Situation. 12 June 2007. ↑ Meldrum, Andrew. US predicts regime change in Zimbabwe as hyperinflation destroys the economy. The Guardian. 22 June 2007. ↑ Chizhanje, Hendricks. Harare suspends release of inflation data. Zimbabwe Online. The Zimbabwe Situation. 14 July 2007. ↑ Nyakazeya, Paul. June inflation 13 000%: CCZ. The Zimbabwe Independent. The Zimbabwe Situation. 27 July 2007. ↑ Banya, Nelson; Dzirutwe, MacDonald. Zimbabwe inflation slows amid warning of collapse. Reuters. The Zimbabwe Situation. 18 September 2007. ↑ McGreal, Chris. Mugabe's price cuts bring cheap TVs today, new crisis tomorrow. The Guardian. 16 July 2007. ↑ Zimbabwe inflation surges to 7,892%. Yahoo News. The Zimbabwe Situation. 17 October 2007. ↑ Nyakazeya, Paul. $1m note on the way as cash crisis worsens. Zimbabwe Independent. The Zimbabwe Situation. 16 October 2007. ↑ Zimbabwe inflation 'incalculable'. BBC News. 27 November 2007. ↑ Zimbabwe inflation spirals again. BBC News. 14 February 2008. ↑ Zimbabwe annual inflation over 100,000 per cent. Sydney Morning Herald. The Zimbabwe Situation. 21 February 2008. ↑ Inflation surges to 165 000%. Financial Gazette. The Zimbabwe Situation. 4 April 2008. ↑ Inflation Hits 355 000%. Zimbabwe Independent. The Zimbabwe Situation. 15 May 2008. ↑ Inflation hits one million percent as prices continue to skyrocket. SW Radio Africa. The Zimbabwe Situation. 21 May 2008. ↑ Inflation gallops ahead: 9000 000%. Zimbabwe Independent. The Zimbabwe Situation. 26 June 2008. ↑ Meldurm, Andrew. Africa needs more courage, says Mugabe. The Guardian. 21 February 2006. ↑ Zimbabwe Inflation Over 900 Percent. ParaPundit. 4 May 2006. ↑ Zimbabwe: Gono ordered to print Z$1 Trillion for Civil servants and Army. Zimbabwe Daily News. The Zimbabwe Situation. 28 June 2007. ↑ Mugabe says will print more money if there isn't enough. Associated Press. International Herald Tribune. The Zimbabwe Situation. 28 July 2007. ↑ RBZ provides $3 trillion for vote buying. The Zimbabwean. The Zimbabwe Situation. 30 August 2007. ↑ Dixon, Robyn. He can get it for you fast. Los Angeles Times. 3 September 2007. ↑ Of cash and dealers. IRIN. The Zimbabwe Situation. 24 November 2007. ↑ Cash crisis: No end in sight. The Financial Gazette. The Zimbabwe Situation. 4 January 2008. ↑ Ndlela, Dumisani. ZANU-PF split looms. The Financial Gazette. The Zimbabwe Situation. 4 January 2008. ↑ Zimbabwe central bank blames banks for banknote shortage. Reuters. The Zimbabwe Situation. 22 January 2008. ↑ Lamb, Christina. Planeloads of cash prop up Mugabe. The Sunday Times. The Zimbabwe Situation. 2 March 2008. ↑ Giesecke & Devrient halts deliveries to the Reserve Bank of Zimbabwe. Giesecke & Devrient GmbH, Prinzregentenstr. 1 July 2008. ↑ & Devrient Halts Deliveries to the Reserve Bank of Zimbabwe. Giesecke & Devrient. PRNewswire. Press release. ↑ McGreal, Chris. What comes after a trillion? The Guardian. 18 July 2008. ↑ 69.0 69.1 Howden, Daniel; Armitage, Tom. Firm with licence to print Mugabe's money. The Independent. 24 July 2008. ↑ 70.0 70.1 Austrian company helps Zimbabwe bank produce near-worthless money. Deutsche Presse-Agentur. 24 July 2008. ↑ 71.0 71.1 Banya, Nelson. Zimbabwe central bank promises currency reforms. Reuters. 24 July 2008. ↑ $100 billion for three eggs. The Herald Sun. 25 July 2008. ↑ Woods, Susanna. 1.2 trillion Zimbabwe dollars for £1. Institute of Commercial Management. 24 July 2008. ↑ Lawa, N. Coins to replace notes (archived copy). The Zimbabwean. 3 June 2005. Archived by the Wayback Machine on 10 June 2005. ↑ Dzirutwe, MacDonald. Zimbabwe introduces higher denomination banknotes. Reuters. The Zimbabwe Situation. 20 December 2007. ↑ Mugari, Shakeman. New notes out. Zimbabwe Independent. The Zimbabwe Situation. 2 February 2007. ↑ Sibanda, Tichaona. Reserve Bank to Launch New Currency. SW Radio Africa. The Zimbabwe Independent. 1 October 2007. ↑ Chimhashu, Torby. New Zimbabwe currency imminent. newzimbabwe.com. November 2006? ↑ Makoshori, Shame. Sunrise 2: Rollout begins. The Financial Gazette. The Zimbabwe Situation. 30 November 2007. ↑ Gono, G. The Imminent Launch of Sunrise 2 (pdf). Reserve Bank of Zimbabwe. Public notice. 21 November 2007. ↑ Sibanda, Tichaona. Confusion as RBZ orders banks to briefly stop operations. SW Radio Africa Zimbabwe News. The Zimbabwe Situation. 18 December 2007. ↑ Zim to introduce $10m note. Fin24.com. 16 January 2008. ↑ Photo of a fifty-million-dollar note (JPG). Canadian Broadcasting Corporation. 4 April 2008. ↑ RBZ introduces new notes. Zimbabwe Independent. The Zimbabwe Situation. 4 April 2008. ↑ Mafaro, Wayne. Harare introduces Z$50 million note. Zimbabwe Online. The Zimbabwe Situation. 4 April 2008. ↑ Zimbabwe releases $250m bank note. The Australian. 6 May 2008. ↑ 96.0 96.1 Lack of bank note paper threatens Zimbabwe economy. Los Angeles Times. 14 July 2008. Retrieved 22 July 2008. ↑ Zimbabwe introduces Z$100bn note. BBC News. 19 July 2008. ↑ Zimbabwe introduces 100-billion-dollar note. Agence France-Presse. Zim2Day. 19 July 2008. ↑ Zimbabwe unveils $20,000 banknote. AFP. 29 September 2008. ↑ Zimbabwe issues $1 million bills as inflation soars. CNN. 3 November 2008. ↑ Zimbabwe introduces new banknotes as inflation soars. Reuters. 3 December 2008. ↑ Zimbabwe to introduce 200-mln-dollar note next week, Xinhua. 6 December 2008. 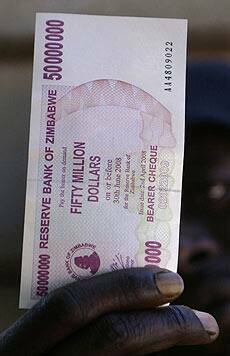 ↑ Zimbabwe introduces $500 million note. CNN. 12 December 2008. ↑ Zimbabwe unveils 10 billion dollar note. Reuters Africa. 19 December 2008. ↑ Zimbabwe introduces new $50 billion note. CNN. 10 January 2009. ↑ Thornycroft, Peta. Bring on the wheelbarrows. The Daily Telegraph. 11 July 2006. ↑ Gumbo, Joseph. Bills Put Zimbabwe Under "Martial Law". Institute for War and Peace. The Zimbabwe Situation. 26 July 2006. ↑ Cold comfort for Mugabe. The Telegraph. The Zimbabwe Situation. 14 September 2006. ↑ Parks, James. Hiding Truth Behind Attacks On Trade Unionists. AFL-CIO. The Zimbabwe Situation. 29 September 2006. ↑ WFP says 1.4 mln in Zimbabwe will need food aid. Reuters. 12 October 2006. ↑ Wave of price hikes dampen hopes for recovery. Zimbabwe Online. The Zimbabwe Situation. 6 November 2006. ↑ Chimhete, Caiphas. Fertilizer saga: Heads likely to roll. Zimbabwe Standard. The Zimbabwe Situation. 19 November 2006. ↑ Cash crisis forces Harare to suspend issuing of passports. Zimbabwe Online. The Zimbabwe Situation. 29 November 2006. ↑ World Currencies: Europe/Africa/Middle East. Bloomberg L.P.
↑ FXConverter – Currency Converter for 164 Currencies. Oanda.com. Oanda Corporation. ↑ Dzirutwe, MacDonald. Zimbabwe redenominates currency to ease crisis. Reuters. 30 July 2008. ↑ Gonda, Violet. Reserve bank reinstates electronic transfers.SW Radio Africa. 13 November 2008. ↑ zimbabweanequities.com, site notice 19 November 2008. ↑ Cost of 3 papers in Zimbabwe: 1 $50 billion note. Fox News. 12 January 2009. Wikimedia Commons has media related to Money of Zimbabwe.